25 September 2010, Cannes – A small group of punk outfitted 40 somethings were lined up outside the Palais des Festival, Cannes waiting to see the legendary – Nina Hagen – 1980’s Queen of Punk and Rock. They were in for a surprise. They probably hadn’t heard that she has moved her music into cabaret style with undertones of gospel/blues and central focus on religion and environmental issues! We tore ourselves from our champagne to see the 30th anniversary Blues Brothers concert, but first a quick review of the opening act, Nina. First impressions – certainly Queen Punk attire was intact. Vinyl leggings, fou fou black short skirt, black and yellow style t-shirt, black goth hair with spotty red/white ribbon on top! Nina Hagen started off with an acoustic set including her version of Depeche Mode’s “Personal Jesus” – where she searched for the divine meaning of the song and then a Doors cover “Riders in the storm”. Next up “God’s Radar,” one could hear how she used her strong voice to blend with Cajun rhythm. The set followed a traditionally bluesy number,”Nobody’s Fault But Mine” and the power of her wide vocal range could also be appreciated. In this context, a musical highlight was the Hagen-infused version of the famous Gospels “Mean Old World”. Scratch guitars and sluggish drums marked this number and, with the unique voice of Nina Hagen, took this well-known gospel to new music heights. Nina Hagen proved she loves honest blues, with one more in this acoustic selection – “Sometimes I Rung Up Heaven”. Interjecting comments about love Jesus, down with the Atom bomb/no more nukes – it felt as if she had just climbed out of time capsule from the 1970-80’s. Launching into some cabaret style “Lilly of the Valley” set left the punk crowd wondering what had happened to their beloved punk queen. However, she hadn’t totally abandoned her roots and did not disappoint the leather clad, orange/red spiky haired crowd with some up beat punk style numbers a la Sid Vicious version “I did it my way” and electronic upbeat numbers such as Seal’s “Killer”. The 30 strong punk crowd rejoiced in pogo dance styles by the stage and gesturing to this most professional Diva. Whilst entertaining, she perhaps was not the right selection to warm up the crowd for the 30th anniversary original blues Brothers party. One wonders if the Palais booking agent checked off “blues music” on her current resume, and thought “great match!!”. If you are fan what do you think of her new style of music/God/Environmental concern? 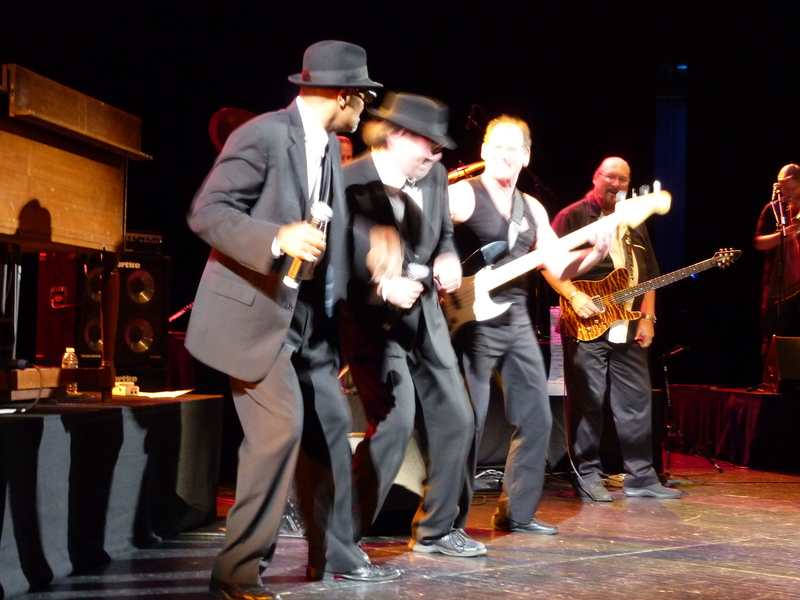 Moving on to our Mission for the evening – to party with the original Blues Brothers Band as they celebrated their 30th anniversary – only 50% of the original band performed (sadly Dan Aykroyd could not join this time) but those that did were still enjoying the music after all these years. 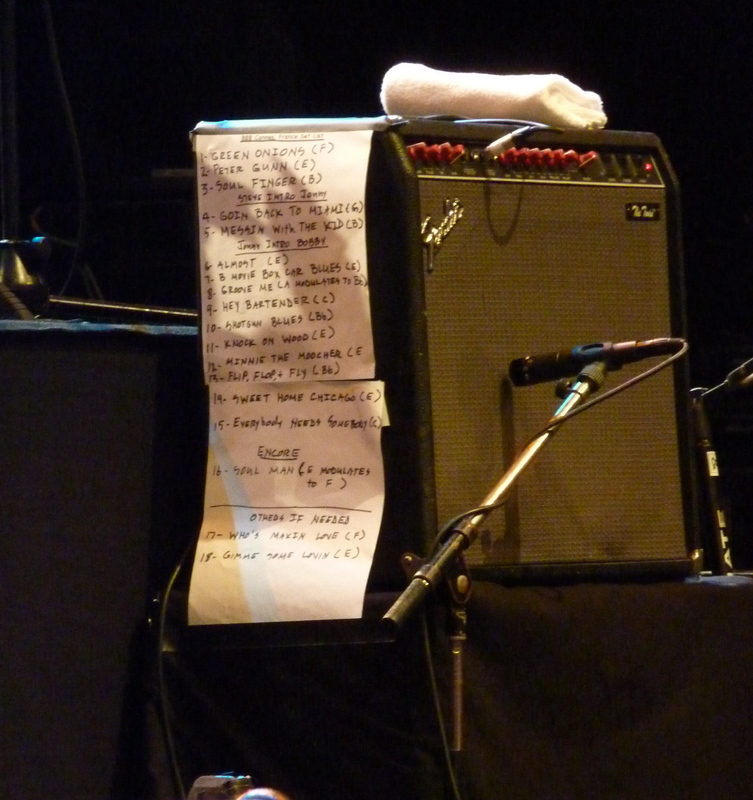 Still using hand written set list! The Blues Brothers are an American blues and soul revivalist band founded in 1978 by comedians Dan Aykroyd and John Belushi as part of a musical sketch on Saturday Night Live. 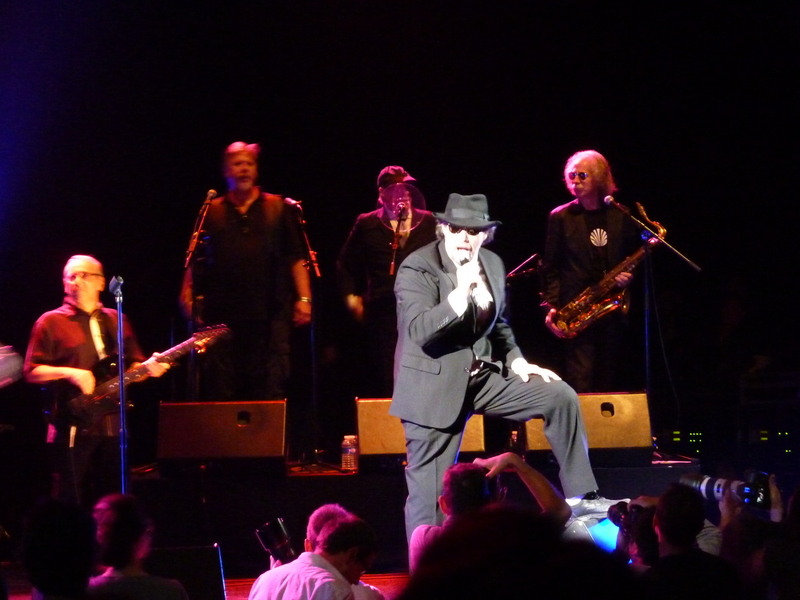 Belushi and Aykroyd, respectively in character as lead vocalist “Joliet” Jake Blues and harmonica player/vocalist Elwood Blues, fronted the band, which was composed of well-known and respected musicians. The band made its debut as the musical guest on the April 22, 1978, episode of Saturday Night Live. The band began to take on a life beyond the confines of the television screen, releasing an album, Briefcase Full of Blues, in 1978, and then having a Hollywood film, The Blues Brothers, created around its characters in 1980. When Jake and Elwood Blues, the protagonists in John Landis’ cult classic “The Blues Brothers,” claimed they were on a mission from God, the Catholic Church apparently took them at their word. Summer 2010 – On the 30th anniversary of the film’s release, “L’Osservatore Romano,” the Vatican’s official newspaper, called the film a “Catholic classic” and said it should be recommended viewing for Catholics everywhere. With that endorsement, the French venue, of Cannes Film Festival fame, had attracted a diverse range of people from 8 to 80 – those who were the original party maker fans, those who were not born and a fringe of old rockers! As tradition dictates, the Band opened with “Green Onion”, moving onto a second instrumental Peter Gunn and rattling off Soul Finger before introducing the “Jake and Elwood Blues “ by way of Jonny “Rock N Roll Doctor” Rosch on vocals + harmonica who kicks off with “Going back to Miami”. He was joined by Bobby “Sweet Soul” Harden during “Almost”. The crowd responded and by the 4th number most of the audience were out of their seats, crowded around the stage and ready to dance and party the night away. The Blues Brothers rendition of “Gimme some Lovin” brought down the house as Jonny ran on and off the stage to party with the audience. Musically the band were tight as one would expect from such a professional group of musicians. A number of marked solo performances were made by Eric “the red” Udel on bass, Legendary Saxophonist Lou “Blue Lou” Marini, more from the horn section – Larry “Trombonius Maximus” Farrell, and finally tribute to Leon “The Lion” Pendarvis for great keyboard playing. Guitarist Steve “The Colonel” Cropper was solid at front but lacking real star leadership that one may have expected from one of the originals. Nevertheless he did spit out a number of awesome solos. The singers did an excellent job to connect with the audience – especially Jonny (also a mean harmonica player!) – who regularly shook hands with the audience members and rushed on and off stage to dance and sing with the band’s fans. Meanwhile, Bobby’s soul voice gave that extra edge to these great blue songs. The encore brought back the band, with original Sax player, Lou “Blue Lou” Marini paying tribute to all band members before launching into “Soul Man”, “Who’s makin love” and “Gimme some Lovin”. Vocalist Jonny rushed around to bring all the kids on stage who had stayed up late with their parents to commemorate this special event. After the kids, anyone able to get past the bouncers could also join the party on stage. In fact, many of the bouncers – no-doubt fans – also took to the stage to dance and thus abandoning their post in favour of homage and celebrating with one of the hardest working bands in the business! Received this rather cool message. This is Jonny Rosch from the Blues Brothers Band. I apologize if this isn’t the correct forum for this note but someone sent me your blog about our recent show in Cannes. I wanted to thank you for such nice comments about the band’s performance. You were also quite kind to me personally with your remarks and I’m grateful for that as well. It does make one feel good to know that folks enjoyed what we were putting out. I hope you enjoyed the show as much as we did performing it. Fantastic crowd. Again. I thank you for taking the time to share what you felt with others and I hope we get to cross paths in the future. All the best.